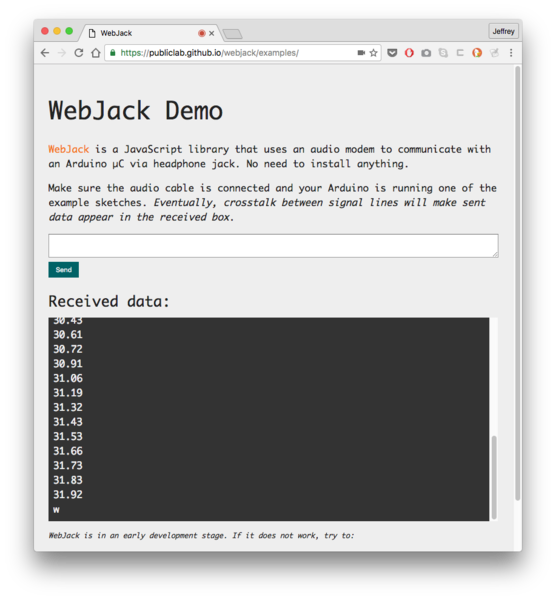  Public Lab: WebJack: Testers needed! This is a tutorial on how to test WebJack. I successfully tested WebJack with a handful of different mobile devices. To get WebJack working with as much devices as possible, I kindly ask for your help on testing at real life conditions! What do you need to test WebJack? Everyone not equipped with an Arduino can switch to this alternative tutorial. It will repeat sending "WebJack" all the time. Ring 2 is the one closer to the sleeve. The resistors and the capacitor don't necessarily have to be of exactly the same values. I've build the circuit with three resistors of 1k Ohm and it worked well, too. The sum of R1 and R3 should not be much less than 1k Ohm. You also don't need a jack as pictured above, I just ripped of a cable and connected the wires of ring 2 and sleeve. Hint for Safari users: please switch to Chrome/Firefox/Opera. Safari does not support WebRTC yet. The browser may ask if you permit to take recordings from the microphone: answer 'yes'. You should see the string "WebJack" ocurring multiple times in the "Received Data" box. If nothing appears after a couple of seconds, or if the output is very cryptic text, the test failed. Else, it was successful and you can skip the following step. That's it, thank you for your help! And of course I would also love to hear your feedback and suggestions in the comments if the test was successful! Hi Richard, These are great instructions! I don't have experience to read the wiring diagram, and can't tell from the photo exactly what the significant positions are on the breadboard, so i'm not sure if i can test this for you. I'll ask folks in my lab, but maybe you could upload another photo? Hi Liz, thanks for your feedback! You can click on the photo to get a larger version. There the connections are visible more clearly. I'll see if I can get it even sharper. Oh, that's so rad, @dusjagr! Why are you keeping it from apple? The WebRTC lib doesn't work on iOS anyhow, since it's not an open platform, but just curious. Or do you just mean getting data into an iOS device given that Apple's made that difficult? Hi @dusjagr, thanks for that hint! Found a Safari compatible version of the FSK generator in your link section. At least sending data to the µC should work now. Wow that's pretty exciting -- safari/iOS would be a huge feature to have. Component Values: R1, 2.2k; R2, 2.2k, C1, 2µF; R3, 10k. I also tried some other configurations and values but same thing. One note of interest is that my phone sends out a pulse about every 40ms. This is the voltage between the sleeve and ring2 without the Arduino attached at all. Here is the audio (which comes through fine!). Probably this pulses are sort of a presence detection for the microphone? Could be an issue, but most of the signals from your recording seem not to be influenced. Definitely an issue is the attenuation of the higher frequency. What browser did you use? I was using Chrome. Didn't try any others. Just curious, but what is the function of the circuit? It's a voltage divider (so your phone won't be damaged by a too large voltage) and a high-pass filter (removes DC voltage). Hah. That's flattering, but my background isn't electrical engineering...I just kind of stumbled into it. The circuit is pretty obvious now that I actually think about it, and you're right, the pulses my phone is sending out don't make difference on the actual signal. 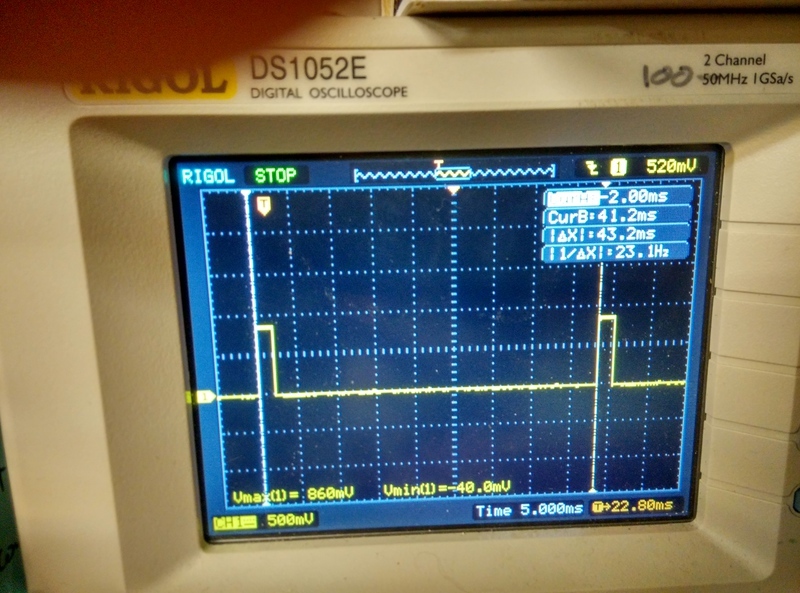 This is the signal going into the phone with R3 @ 2.2k and C1 at 0.1µF. Also audio from Opera and Firefox. Same phone, still not working on either. Cool, looks good. Thanks for your effort! Maybe try switching the wires to sleeve and ring2. yeah. no dice...still doesn't work. I'll try it on a different phone when I get home. Oh yes, the signal is still attenuated. Didn't see that on my phone yesterday. What are you looking at specifically when you see that the higher frequencies are attenuated? 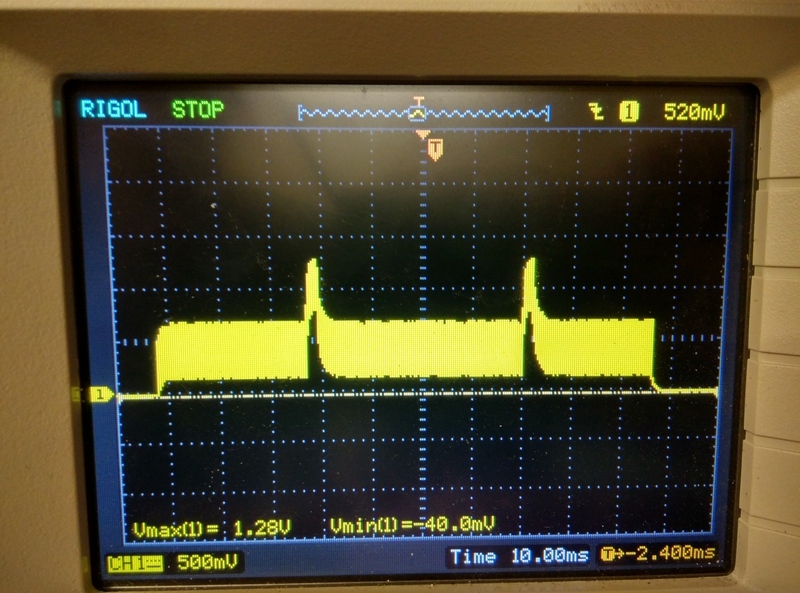 What part of the waveform, can you highlight it? I should have time tomorrow or Sat to test this out, i've been looking around for components to use to test it. The output of an Arduino is what, 5.5v? Or some other voltage for the serial pins? And what's the desired max for a headphone's ADC? For an (unequally) attenuated signal, the amplitudes for f_low and f_high are uneven. In this case, the amplitude for f_high is very low. 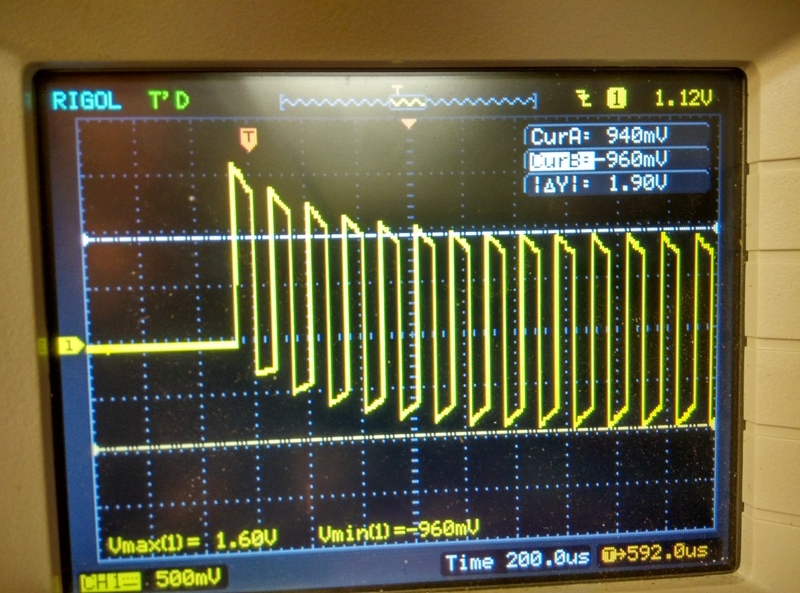 I think up to 0.5V should not be a problem at all. This is on the Nanite841: http://www.watterott.com/en/Wattuino-Nanite841 - https://github.com/cpldcpu/Nanite, which is ATTiny85-based. I'd tackle this, but I think perhaps you know more about this than I... though I could give it a try. Maybe we should create an issue on the WebJack project so as not to make this thread too long. I made some progress (rather crudely) copying over the 2-parameter write(const uint8_t *buffer, size_t size) method from the version of the SoftModem library you linked to, into the SoftModemTiny library I found, and got bogged down in some C errors (statics not defined in scope). I'm pretty rusty in C, though. Reason I ask is that in the past, I've plugged this nanite with no voltage control into the headphone port of an old iMac, and just recorded audio directly into GarageBand. I know this is a risk, but I'm not sure if the peak/trough max range accounts for being DC (which'd be a 3v swing in positive) or something... or if the ADC in the iMac is just pretty robust. This was with SoftSerial, not SoftModem (which as mentioned I haven't gotten working on an ATTiny yet). Long story short, I'm interested to try just plugging this directly into an old Android phone, and seeing if I can receive SoftModem messages directly off the Tx/Rx pins. If the nanite's output is 3V, then the voltage at your phone will be about 3V as well for the first few periods. But after a couple of periods the maximum voltage (=amplitude) will swing into the half of that. The third picture from kinasmith displays this behaviour very well. I'm confident the ADC of your phone is robust enough, but I can not guarrantee that it will not break. Oh, cool! I heard that "dimming" occur when I piped the sound through a small amplifier, but didn't know it was supposed to be that way. Neat. Thanks, I'll try as soon as I try the new attiny code. Thanks! Cool, thanks for your effort! I also have a Leonardo I can test this out on, I'll dig it up. Leonardo is again a different processor with different names for the timers used in the library. I think we can fix that with some #ifdef's in the lib. @rmeister -- WebJack is a lovely piece of work! I connected a thermistor to a Pro Mini, used the voltage divider and capacitor setup recommended above, and it all worked very easily, using your nice sketch examples and the very clean demo code. I gladly try to answer questions if there are any issues with WebJack. That is the coolest. Here's the video embedded! Don, could you open a PR of your graph example page so we can include it in the WebJack demos? PUHLEEEEEEZZEEEEEEE?????? OMG that totally worked!!! Over open air too -- no cable! From my laptop to a neighboring desktop, with the volume turned up. It worked better when I held it up to the microphone a bit. Hi, I noted that on the WebJack page, the illustration shows the use of the 5v pin, but here it's not shown. Is it essential? I seem to have been transmitting without it, actually -- and I'm curious because why is a 4-pin cable necessary? Ah - i think i figured it out -- even if we only use 3 pins, we need the extra ring to connect with the A/V port of a smartphone or similar device, since that's how we are using both input and output from that device. Not sure what 5V pin you mean, but yes a 4-pin cable is need to connect to the microphone input of smartphones/mobile devices. Well, just asking about the positive pin shown on the Fritzing diagram -- 5 volts -- which is not on the diagrams on this page. Thanks! If this is correct, it seems we may have focused on completely complementary projects, which would be beautiful! I'm looking for any info on baud rate or bit rate in the WAV assembly. 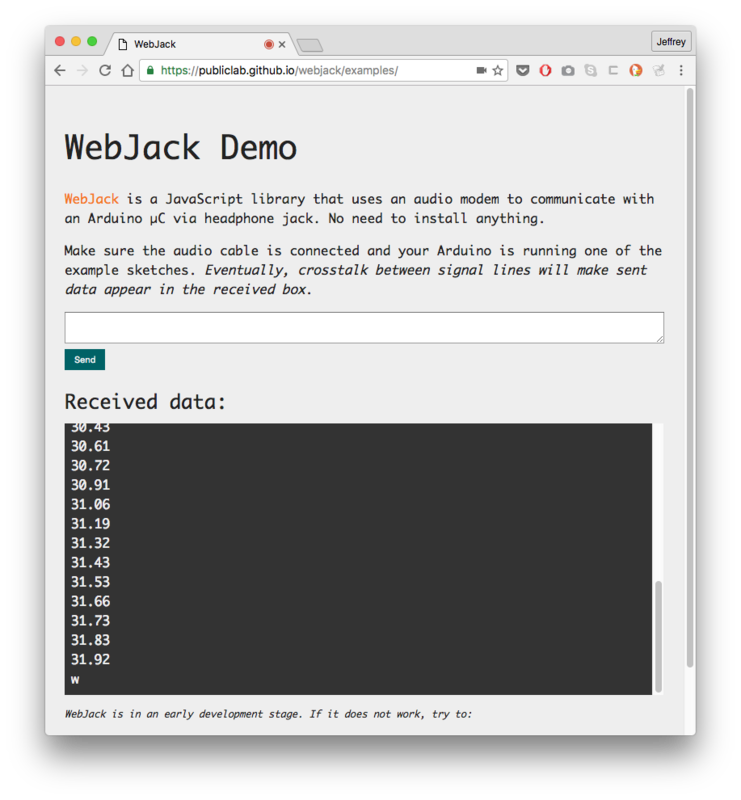 My thought was that it's possible WebJack could directly generate the audio to program, rather than going through the Arduino IDE. Not instead of, but just as a possible option. And many other ideas -- thanks so much @dusjagr for clueing us in to this amazing work! yip. just discussing on our other mail list of the "Center for Alternative Coconut Research". below the response from Christoph. and yes, sofar we focused on a bootloader, so non-geeks, can easily change the code on the board. great for musicians or other non-tech people, and we can share synthizers on a website as .wav files. similar for wearable applications of the attiny85. the original code is ancient... developed for the atmega168, but not yet for 328.
if the webjack people would do any coding for the project, I would strongly recommend that they move to the digital differential manchester coding as I use it in the bootloader. The coding principle is 10x faster than the one they use and it is much easier to implement and the calculation load for the microcontroller is less. Great post! Any updates on this project? We'll be talking about data loggers on Monday's OpenHour - would be great to hear more about the webjack there, can probably recruit some more testers if you're still looking!